As promised, we have another red, white, and blue recipe for you today! 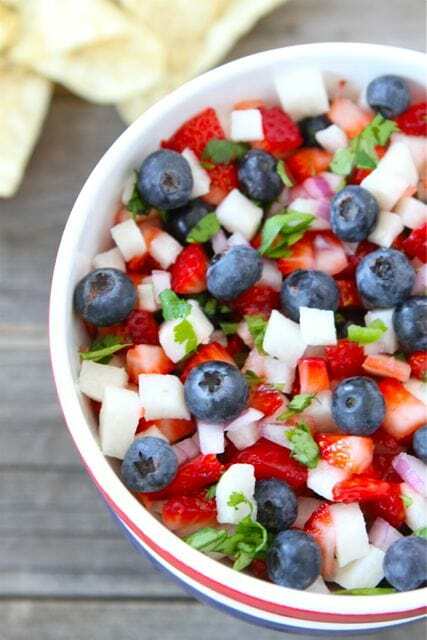 We’ve already shared patriotic recipes for breakfast and dessert, so now it’s time to get snacking with Blueberry, Strawberry, and Jicama Salsa. 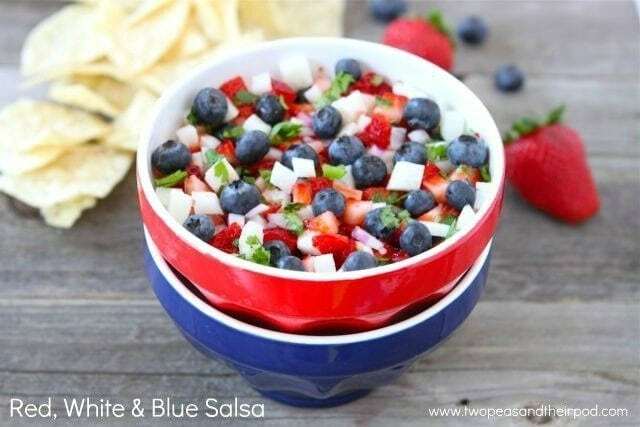 This red, white, and blue salsa is the perfect appetizer or snack for your 4th of July party. I am in love with this salsa. Not only is it pretty, but it is full of flavor and so easy to make. I love the combination of sweet berries and crunchy jicama. There is a little bit of heat from the jalapeño, but if you like a mild salsa, feel free to leave it out. Serve with store bought tortilla chips or you can make your own baked tortilla chips. I’ve also enjoyed it with cinnamon sugar pita chips-so good and so addicting! Josh likes to top grilled chicken or fish with this red, white, and blue salsa. 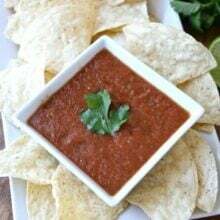 It is a great salsa for just about everything! 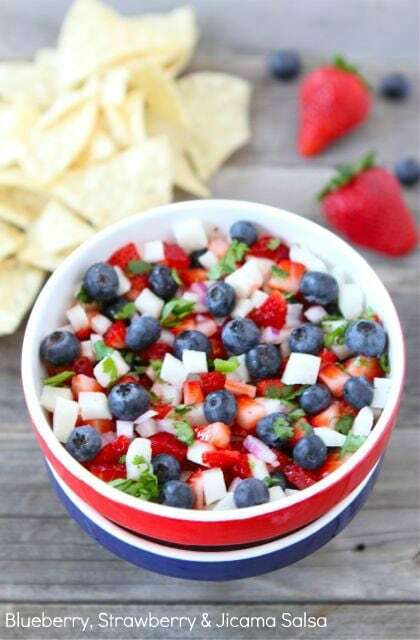 Add this festive Blueberry, Strawberry & Jicama Salsa to your 4th of July menu! And if you can’t wait until the 4th, no worries. It is a great snack for any summer day. I think I will make a bowl of salsa this weekend! 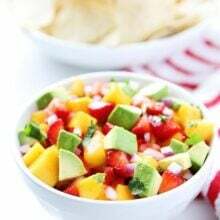 A fresh and fruity salsa with a nice crunch! Perfect for the 4th of July...or any summer day! In a medium bowl, combine blueberries, strawberries, jicama, cilantro, red onion, jalapeno, and lime juice. Stir until well combined. Season with salt, to taste. Serve with tortilla chips at room temperature or chilled. Note-this salsa is also great with grilled fish or chicken. It is best eaten the day it is made. This sounds so delicious and fresh-tasting! Ohhh, I love it! Colorful and tasty! Perfect combination!! Love all your red, white and blue recipes!!! Love the colors! Beautiful photo and I am sure it’s delicious. This looks so refreshing for summer, perfect for the 4th of July! I like the addition of blueberries. They make everything better. Jimica! What a great addition. Love it! Love, love, LOVE this! I am obsessed with jicama. And it is so pretty and perfect for Independence Day! i would just devour this with a spoon! That looks absolutely beautiful! What a great addition to the menu for the 4th! I want to go berry bobbing in that! This looks so good. Can someone tell me though what jicama is and where would you find it at? Thanks. Jicama is a root vegetable. It is round with a brown exterior and white interior. Peel off the brown part and dice up the inside. It provides a nice crunch to the salsa. You can find it in the produce section. I need to get my hands on some jicama. It sounds delicious with the berries for this salsa. I am glad you are enjoying our recipes! Love it! Colorful and delicious! So festive, Maria! I would’ve never thought to add jicama to salsa. Perfect summer bbq treat. Looks super delicious and SO colorful! I’d definitely be impressed with this at a 4th party! Jicama is my latest obsession and I’m always putting it in everything! Thanks for sharing! i love the colors! and those flavors sound so delicious! So festive & patriotic!! Love this! I love, love, LOVE this!! So pretty and it looks delish! I can’t wait to see how many red, white and blue ingenious recipes you’ll be posting. And I sure do love that watermark 🙂 YOU GOT IT GIRL! This is so unique! I never would have put these ingredients together but it looks great and I love the suggestion of the cinnamon pita chips. This is almost to pretty to eat, but I would totally eat it! It will look great on party table. 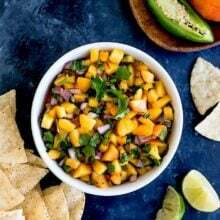 Loving all these fruit salsa recipes! Something I would never think of, but delicious nonetheless! I’m not gunna lie- this is SOOO my kind of recipe and your pictures look so fun- makes me wanna jump in that bowl and take a scoop to put on my Greek yogurt. Lovely post Maria, as always. Have a great weekend and give the lil’ pea a hug from me. Jicama + strawberry. What a great idea! I love both flavors. Yum! Such a pretty and vibrant salsa! Great recipe and photos!!!! your blog is amazing!!! You have a new follower!!!! Just made this for a BBQ today and it is delicious! Will definitely make it again. Thanks for posting awesome recipes. I love jicama, but I always forget to utilize it in salads! Looks awesome but unfortunately I was born w/the defective cilantro tastes like soap to me gene. I normally pass on any recipe that has it but I’m thinking this could get by w/out – or a substitute? I wondered if you could use mint instead of cilantro. Yes, mint would be great! Enjoy! Maria, I love this salsa! How much fun is this and pefect for the fourth. And jicama is one of my favorite summer snacking veggies. Lovely post! I will for-sure be eating this out of the bowl with a spoon. What a festive, yet healthy treat! yum! healthy, vibrant, flavourful, this looks like it ticks all the boxes and has it all! Love this! And I love how unique it is! Who needs a chip? I could eat this as is. What a great way to show your patriotism and boost your fiber intake all at the same time! I love it! I posted blueberry salsa last week too! I love the addition of strawberries in yours! I am making this tonight! Seriously… last week my boyfriend came home with a container of jicama and said “this would probably be cool in something… I don’t what, but I’m sure you can think of a good jicama recipe.”, I discreetly tossed the container in the dark corner of the fridge and left it at that. But now I can use it – thanks, Maria!! What a fabulous idea and its gorgeous! Definitely going to try this! I think I’m going to have to go and make this RIGHT NOW. Looks amazing. wow, this couldn’t be more perfect for the 4th!! This looks (and must taste) simply amazing! What a super idea for the 4th! Will definitely be making this one. Made this for my son’s red wagon themed first birthday party this past weekend and it was a big hit. Served it with corn chips & (per your suggestion) cinnamon & sugar pita chips. The pita chips were the run away favorite! Thank you for this recipe & so many others! Yum! So fresh and perfect for the holiday! What a great idea and mixture of ingredients! Pingback: Make it a Pin-teresting 4th of July! Love this idea! This really is a beautiful summer salsa recipe; I love all of the colors, and it really is perfect for the 4th. Since I’m not the biggest cilantro fan, and I didn’t have some of the other ingredients on hand, I ended up making a fruit salad loosely based on this- I think it turned out pretty well (http://bit.ly/MgiPaJ)! However, I’d still love to try out your full version. Are there any other herbs that might work in place of the cilantro, or is that just the silliest question ever? I follow on pinterest and love kitchen aid products! “Blueberry Strawberry & Jicama Salsa | Blueberry Salsa Recipe | Two Peas & Their Pod” definitely causes myself think a little bit more. I admired each and every particular piece of it. Could this be made ahead and frozen? I am the only one in our house that would eat it so I know I couldn’t finish in a day. If not frozen any other suggestions? This salsa looks just beautiful! So happy I found it..on Pinterest! I hope you don’t mind that I shared it on my blog (set for Saturday) and I posted a link back to your blog for the recipe. This looks absolutely delicious! I love anything with jicama in it and think the colors are gorgeous. Definitely making it this year, even if our 4th of July gets rained out. This looks awesome – love the combo of flavors!! So clever, Maria! I love jicama too, so this is perfect for me. Pingback: Health Benefits of RED, WHITE & BLUE Foods Plus 5 Recipes! Just finished making this for our 4th of July party today. We loved it last year too! This looks great! One problem, though. What could you substitute for the cilantro? It tastes like soap to me and my family! Made this today for our neighborhood potluck -7/4/2103- was all gone so I’d say a huge hit. Yummy and refreshing!! Will definitely make it again! Made this side dish for the 4th. My family loved it, except the husband, who eats his chips plain unless of course there is something cheesey within dipping distance. Pingback: 25 Fourth of July Food Ideas! This looks so super delicious, I featured it on my blog (with track back) for my Australia Day post. Not gonna lie, I’ve never heard of jicama and don’t think I’ll be able to get it in Oz! But if I do I am so trying this! This is my introductory recipe with I tried with jicama. I made it, and I have to say, you can easily overdo the cilantro so it overpowers the salsa. The jalapeno amount is barely noticeable. Also, in mine, the jicama changed color when mixed with the strawberries, so if you want the jicama to remain white, add and mix gingerly towards the end of the blending. Can’t wait to try another recipe in the future from you guys! Pingback: Happy 4th! 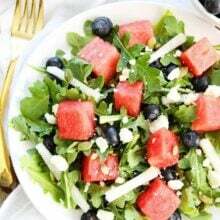 Healthy Red, White and Blue Themed Recipes | Lose It! I just had some fish tacos out the other night that had a jicama salsa– and I can’t get it out of my mind! This is a great option. Pingback: Fun 4th of July Recipes! This looks amazing! I can’t wait to try it this weekend! This is the 3rd year in a row that I’ve made this for 4th of July! Each year, it’s a hit! Thank you for this wonderful recipe! Pingback: Whole30 + Vegan. Is that even possible?? Pingback: Red, white and blue healthy party snacks | The Best Socks You'll Ever Wear-Guaranteed. Hi Josh and Maria! Just wanted to let you know that we featured your awesome recipe on our Fourth of July recipe list (here – http://list25.com/25-fourth-of-july-recipes-that-are-worth-celebrating/, #20). Feel free to let me know if you have any more holiday themed recipes! Pingback: Provence Catering – Happy Fourth Of July! We made this with our after school students several years ago. I like it so much that it has became a yearly thing I make for the Wayne Henderson festival in Grayson Highlands State Park. People sitting near have inquired about it because when you take the lid off it smells so good. Every year some stranger ask me for the rescipe. I LOVE this recipe. I make it every 4th of July and it’s always a big hit! Made this yesterday for a BBQ – it was delicious! Making it again tomorrow for another BBQ. Tasted fine, loved the texture the jimica added to the mix. However, the photo is deceiving. Once the ingredients are mixed, the strawberries will stain the jimica red, the white is lost, and the 4th of July red-blue-white turns into a far less interesting red-blue mix. Best Medical Education Website https://www.rishacademy.com – Download Presentations, Books, PDFs, Flashcards, Mnemonics and thousands of study materials for Free. I finally got to make this blueberry strawberry and jicama salsa this past weekend and it was such a hit!! Have a great weekend. Can i post it on my blog? This has two of my toddlers’ three favorite fruits, so we’ll definitely be making these. Thanks for the recipe. Blueberries are my favourites. This recipe is great. Thanks for sharing it. Finally got to make this blueberry strawberry and jicama salsa yesterday and my wife liked them. Thanks for sharing. 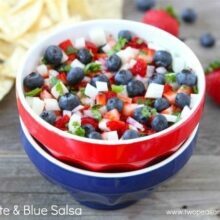 I’m loving this red white and blue salsa! I imagine the crunchy jicama gives it a fantastic texture. Awesome salsa! I’ve been making this for 2 or 3 years now on July 4th and my family absolutely loves it. I’m making it again today and will be sampling it as it’s made. So happy this salsa has become a tradition for you! More than how it looks and tastes the reason I love the recipe is because of how healthy this is. I never thought about doing a “fruit” salsa. This sounds amazing!